Quickrequest: "Internal roller burnishing tool for through hole"
Loosen clamping screw (8), then turn the fixture (1) and sleeve (2) against each other accordingto scale. One mark is equivalent to 0.01 mm in the diameter. Retighten clamping screw (8). Tip When setting up a tool, the revolution speed can be considerably reduced, however the feed rate per rotation is not to be decreased. When conducting roller burnishing under unfavorable conditions, e.g. when using high-strength materials, with insufficient lubrication or very deep holes, it is advisable to reduce the revolution speed. To carry out a fast basic adjustment of the tool, it is advisable to adjust the tool to the smallest dimension and then to guide it into the pre-machined hole by hand. The tool can then be adjusted in the hole until the rollers are felt to contact the surface. Starting from this setting, the pre-clamping can be increased by 1-2 marks on the scale. This basic adjustment then usually requires only minor corrections dependent on the achieved roller burnishing result. a) Loosen clamping screw (8) and screw the fixture (1) out of the sleeve (2). The rollers (5) become clear. Replace the rollers in sets and remount the components. b) Remove the locking ring (9) and lift out the cage (3) towards the front until the rollers are clear. Replace the rollers in sets and remount the locking ring. Loosen clamping screw (8) and screw the fixture (1) out of the sleeve (2). Unscrew clamping screw (7). Pull the taper (4) out of the fixture. 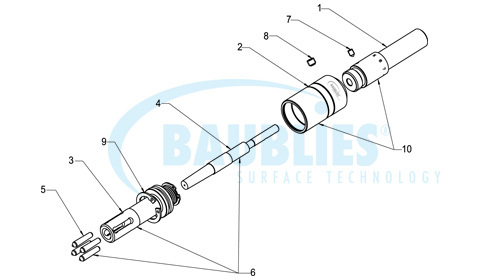 Replace the taper and remount the components. Please Note: When assembling, ensure the correct position of the countersink in the taper and the clamping screw (7). Remove the locking ring (9) and lift out the cage (3) towards the front. Replace the cage and remount the components. 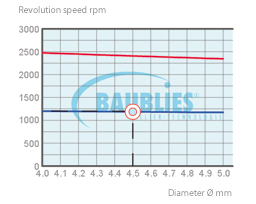 The graph below shows the revolution speed and the feed rate for the whole diameter range of the IRG-1-D.